A village doctor is a familiar figure in our country. He is known to almost all the villagers. 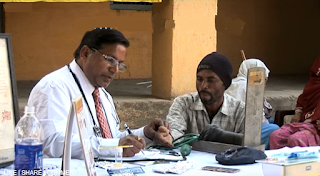 He serves the primary health care and in case of dying patients, he refers them to the hospital. As he is not a well-trained doctor, people usually call him a quack. Actually, his service saves valuable lives of the villagers. His knowledge of medicine is very little. He does not receive any medical degree from a medical college. He only undergoes a few months’ training under the non-govt LMF training center or under a medical practitioner. Then he starts his independent practice. A village doctor is one of the busiest people in the village. He has to respond to the calls of the patients. He serves all day long even he passes sleepless night for the patients of the village. He not only serves the patients even he advises them to take better treatment for the hospital. His making of treatment is very simple. He never deals with critical patients. He possesses a very small number of scientific apparatus like a stethoscope, a BP machine, some injection instruments etc. Every now and then a village doctor has to struggle with rude behavior of the villagers. Usually, villagers appeal to him to take care of the critical patients but he is unable to do anything for them. Sometimes he deals with critical patient and fall in danger. With all these difficulties his position in the society is not negligible. Everybody respects him for his noble deed. Usually, a village doctor possesses a small dispensary with lower priced medicine. In his dispensary, he given advice prescribes medicines to the patients. He has one or two almirahs in his dispensary. He has not a large stock of medicine. He has only cheap and common medicine in his dispensary. The importance of a village doctor a simply great. His primary treatment saves a lot of valuable lives. His humanitarian work helps us to do better for the society. sometimes he treatment on a village fair. Actually, a village doctor is an important person among the villagers. As he is not skilled enough in this sector. Sometimes he gave wrong treatment. People should be aware of this. And it is hoped that he should take further for the betterment of his profession.